Terracotta warriors returned to the UK almost a decade after the last appearance in the British Museum. And this time, these Chinese clay warriors went to Liverpool World Museum from 9th February to 28th October and won lots of fans. Some of them even visited the museum three or four times just to spend more time with the warriors and expressed their wishes to see the warriors in their real home – Xi’an of China. British people were so crazy about the warriors. Nothing can show their fondness of the warriors than sell-out. Before 9th February, the museum already presold over 140,000 tickets, which broke the record of the museum. It received more than 600,000 visitors during the exhibition. Really a huge success! When the final day came, the museum posted on its official account “Miss you already”. It’s really hard for them to say goodbye to the warriors. All the fans wished the warriors a safe journey back to China. Before the Xian China Terracotta Warriors swept the world, the Eighth Wonder of the World slept under the ground for 2,200 years. 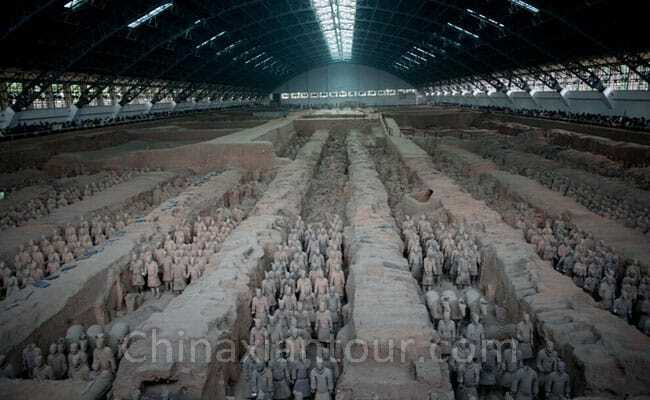 In March 1974, an accidental discovery by a farmer who was digging wells revealed the terracotta army to the world. Until now, over 8,000 life-size terracotta warriors have been unearthed, and they differ from one another in clothing, hairstyle, posture and facial expression. Since the opening to public in 1979, the terracotta warriors attract millions of people from all over the world each year. More than 200 heads of foreign states and governments paid their visit. Numerous people fell in love with Chinese culture because of the terracotta warriors, and the warriors have become one of the things that represent China throughout the world. Both Chinese and British sides tried their best to give the visitors a brilliant exhibition. Over 180 objects packed in 38 boxes flew to Liverpool including general figurines, kneeling figurines and standing figurines. For half of them, it was their debut in the UK. Among the warriors, the most impressive one is the general standing figurine, one of only nine that have so far been excavated. You’ll be amazed at the exquisite crafting when you get closer to look at the warriors. Some visitors said “They’re almost alive”, “They just make me feel as though they could walk at you now” and things like it. If you’ve missed these exhibitions, don’t be upset. Why don’t you come to Xi’an for a trip to see Terracotta Warriors? Here is the good news. Some large cities abroad like London have direct flight to Xi’an. You can have all the over 8,000 terracotta warriors right before your eyes. It will be a far better experience if you really stand in the place where the terracotta warriors and horses actually were buried with China’s first emperor. In addition to the warriors, you can give yourself an opportunity to explore more about Xi’an, which is an ancient capital of China with great historical significance and profound culture. Just jump on a plane for your China Xi’an trip. Wish you no more regrets.